Tough outside, comfortable inside, this logger includes our exclusive DRYZ® QTS™ for 360 degree moisture management. I've had these boots about 5 years now and have put them through alot of work and they are still going strong. Quality is right there with Wesco and Thorogood and break in easy. These make those non USA made boots feel like slippers, I love them!! Most comfortable boot I’ve had in a long time. Best pair of logger/packer boots I've owned. Rugged and extremely durable, they feel like they won't lose their shape. Color was true to Shoeline pictures. 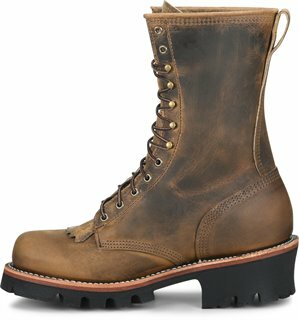 Just a great looking durable boot that I would recommend to anyone who works or plays the outdoors. I've had these boots 6yrs and I love them. Stitching to the soles. Solid, comfortable, love the pillow insoles, light sometimes forget I'm wearing boots!!! Love the ankle support, all around quality boot. Boot felt great right out of the box. More lightweight than most boots I have worn. Excellent boot right out of the box , very durable , best boot for working 12 hr days doing construction ! Best I have ever worn , on my 4th pair . 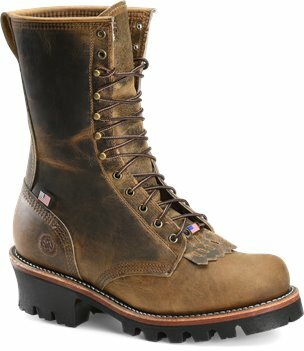 This is an awesome boot, I highly recommend it for the outdoorsman. Great boot! Very well made. Normally wear a D width, had to go with the 2E. Easy returns, boots are great, comfortable right out of the box. I have not wore the boots yet, as they are a little narrow, so I will be ordering a wider width. They are nice looking boots and lighter than I expected. They look to be great quality and look like they will last a long time. I will write a new review when I can wear them. Best boots for the money. Period! As soon as I saw these boots I just had to have them. They are the best looking and most comfortable boots I have ever owned. I get compliments on them all of the time and I never hesitate to recommend them. I even wear them on the weekend with jeans and always feel like I look good. I'm in the initial break in but they are very comfortable. I wish they had Steel Toe, but that would not make them more comfortable just safer. Hands down.. the best boot on the market! And it's made in the USA. what an awesome pair of boots. take a beating and still look and perform great. also great protection. stopped a chainsaw from getting any skin today. Excellent boot good quality very true to size and width. Absolutley no break in time would buy again. I like the DRYZ QTS lining. It works. They are very comfortable and flexable - good for a 10 hour day.